Have you ever come across yet another feel-good quote and instead of being inspired by it, you roll your eyes? 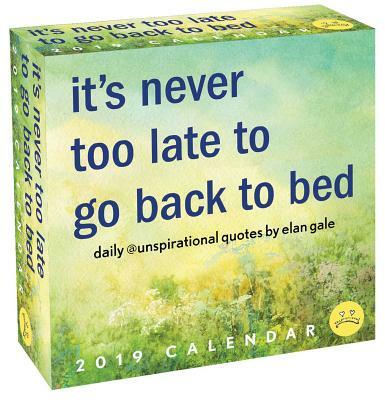 Then the Unspirational 2019 Day-to-Day Calendar may be just the calendar you are looking for. It features UNspirational quotes, rather than INspirational quotes, providing an ever-so-slightly pessimistic twist on the inspiration that's everywhere today. Based on the Instagram account @unspirational by Elan Gale, these daily quotes are sure to help you keep it real with a little sass and humor. After all, "If there's one thing we can all agree on, it's that we can't seem to agree on anything."